Boiler Plus has been in full effect for over five months now, so you would think installers and governing bodies alike would have their heads wrapped well around the new legislation by now. However, one month before the legislation came into place a survey conducted by Logic4training found that 57% of installers had little or no knowledge of the Boiler Plus legislation and how it will affect them. So what has changed nearly six months later? The main aims of Boiler Plus were centred around improving efficiency levels of combi boilers (to bring minimum efficiency to 92% ErP) with a number of ways that installers could comply: load compensation control, weather compensation control, smart thermostat with optimisation and flue gas heat recovery unit. However, during the launch of this new legislation there were a number of conflicting messages being circulated, with one of the main sources of inconsistent information coming from British Gas. 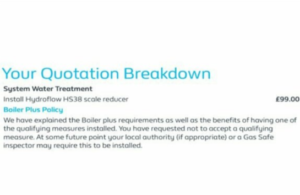 An image was widely circulated amongst the heating community on social media which suggested that British Gas customers could opt out of having Boiler Plus compliant measures with their new boiler installations. 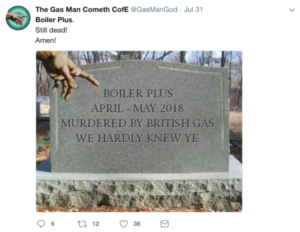 It seems that British Gas, one of the leading energy suppliers in the UK, was not the only source of conflicting information. 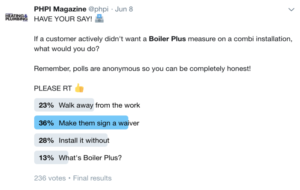 This poll by PHPI Magazine not only shows that industry professionals were reacting differently to the new rules but also that a significant amount of people still didn’t know (as of June 2018) what Boiler Plus was. So what is it? If you are one of the 13% who doesn’t know, Boiler Plus is a piece of legislation which is part of the Heat In Buildings policy that means that new gas-fired combi boiler replacement installations in England must be installed with either a smart, load or weather compensation control or a flue gas heat recovery unit. Despite the intentions of Boiler Plus to encourage energy efficiency improvements, the general consensus from the heating community was that its introduction would not lead to more business. Five months on, what’s changed? Although many installers have felt the brunt of the upheaval in the installation process, figures are suggesting that boilers are getting more efficient within the UK and, as a result, energy efficiency is improving overall. Another part of the legislation set out to “ensure all households have a reasonable level of choice and control to enable them to achieve comfort and efficiency without increased bills”, and despite some difficulty in implementing the successful roll out of smart meters, customers do now have more choice when it comes to the type of controls that are installed in their homes. We thought we’d conduct our own piece of research (well, a Twitter poll) to see if the general attitudes of installers had changed. 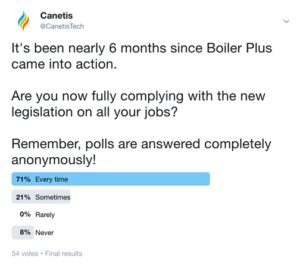 It seems that heating engineers, or at least the ones who answered our poll, are now more likely to comply with Boiler Plus, and 71% of respondents are complying on every job they undertake. The conclusions to be drawn from this are clear. Although the introduction of Boiler Plus was slightly haphazard (to say the least), heating engineers and industry professionals alike have adapted. 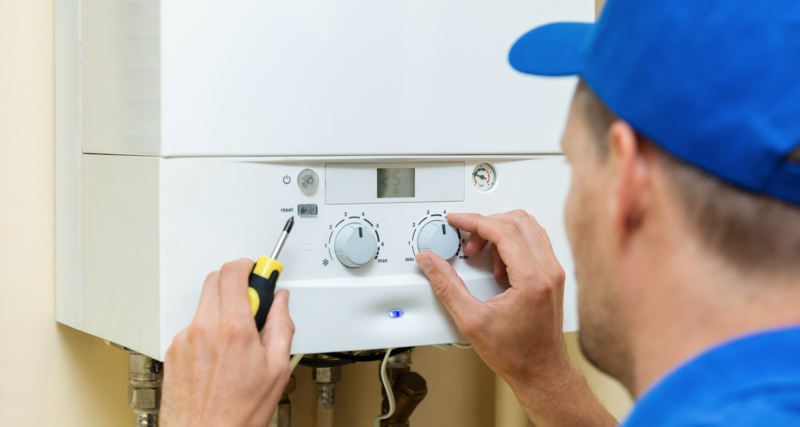 People don’t generally like change and it takes time for them to work out what’s happened and why they need to respond, but if the changes are for the good – which Boiler Plus definitely is – then they will adapt. With version two of Boiler Plus due to come into effect next year, maybe installers will welcome the next phase of legislation with open hearts and minds and the new energy efficiency measures will become something that everyone accepts as standard.